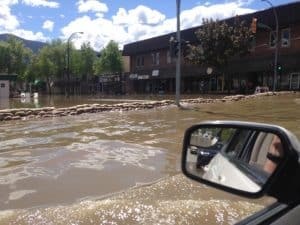 For four weeks in June of this year, I had the privilege of working with Samaritan’s Purse, doing disaster relief following catastrophic flooding in Grand Forks, British Columbia. The experience was profoundly satisfying, empowering and humbling. Grand Forks is located at the confluence of the Granby and Kettle Rivers in the southern interior of British Columbia. Spring flooding along river banks is a common event, usually with little or no permanent damage to park and recreation sites along the rivers. Building in the flood plane is restricted to higher than the highest flood level in recorded history, which occurred in 1948. This year was different. The snow pack was well above normal; in other words, there was a lot more snow to melt and swell streams, rivers and lakes areas. This did not bode well for those living along waterways in the watershed. 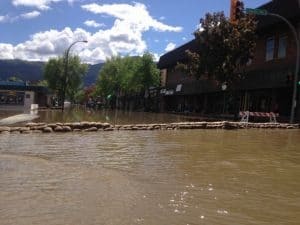 Grand Forks began to plan for higher than usual water levels in lower elevation areas of town: public announcements were made, sand bags were filled and distributed, residents were alerted and instructed on evacuation procedures. Community members rallied to shore up sand bags and move furniture and equipment in an effort to preserve belongings. Others brought food for the volunteers. The community came together to try and avert disaster. When the rivers crested, the weather brought rain and the problem was compounded. Eventually, flood waters surged well past the 1948 high water levels and extensive flooding began. Homes and businesses were sandbagged; basements were pumped, but eventually, the rivers won. Flooding was wide spread. And then the dike protecting the Ruckle residential area failed. 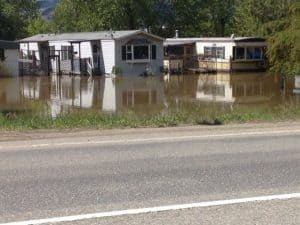 Flooding in Ruckle was catastrophic. Heroic feats followed, as residents who did not leave their homes in time were rescued. Evacuation centres and local motels filled with the new homeless. The Red Cross arrived to help. Provincial emergency services took charge as the downtown core became a lake. All businesses closed. Television coverage of the disaster spread the news of Grand Forks’ situation at a national level. The Salvation Army arrived to help. The Canadian Armed Forces were requested to provide much needed relief for exhausted volunteers. The anticipated second surge in water levels did not reach the high levels of the original surge but did delay recovery. Finally, a crew of 50 inspectors was able to go into flooded areas to perform rapid damage assessments. Structural damage, water-logged electrical boxes, and mold growth were all safety issues identified. Finally, residents were allowed back into their homes to deal with the aftermath. Water damage necessitated discarding any home contents soaked by flood waters, as sewage contamination was a factor. Furniture, carpeting, drywall, clothing, books, and everything that could absorb water had to be thrown out. It was heart-breaking. As a resident of rural Area D of Grand Forks, I offered help to my neighbours to the west and, most importantly, downhill of the home I share with my husband. Their basement and the cabin on the property where a relative lives were flooding. “We turned off the pumps at 5 o’clock this morning,” they told us, resignation and lack of sleep dulling their voices. We offered them the use of our home for the 10 days we would be away visiting family in Ontario. On our return home, I had to do something to support my community. I rode my bike to the Resiliency Centre at the local recreation centre and asked what I could do to help and there I was directed to Samaritan’s Purse. They answered my call on a Saturday evening (surprise!) and told me they would welcome my help on Monday morning at 7:30 a.m. at Riverside Valley Church. This is where my adventure began. 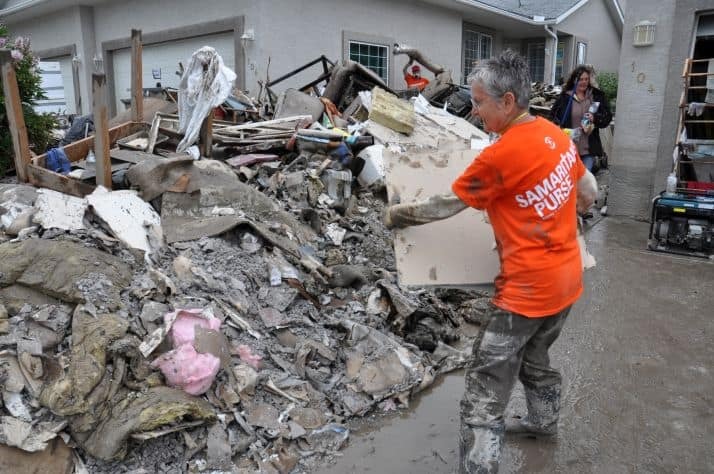 Samaritan’s Purse is a Christian non-profit organisation that primarily does disaster relief in Canada. I urge you to learn more about this amazing organisation at their Canadian website here: samaritanspurse.ca Closely linked, and part of the ministry in Grand Forks is the sister ministry of Billy Graham Ministry, the chaplaincy arm of the mission. I arrived early. I was met by smiling faces, everyone saying, “Good morning!”, even though I knew no one. It was a habit I quickly caught and used in my subsequent days volunteering with Samaritan’s Purse. I did, however, time my arrival later and later as I no longer had to sign a release form, watch the safety video, or figure out the lunch making routine. I did, however, have to sign in daily at the church and then again at each work site. 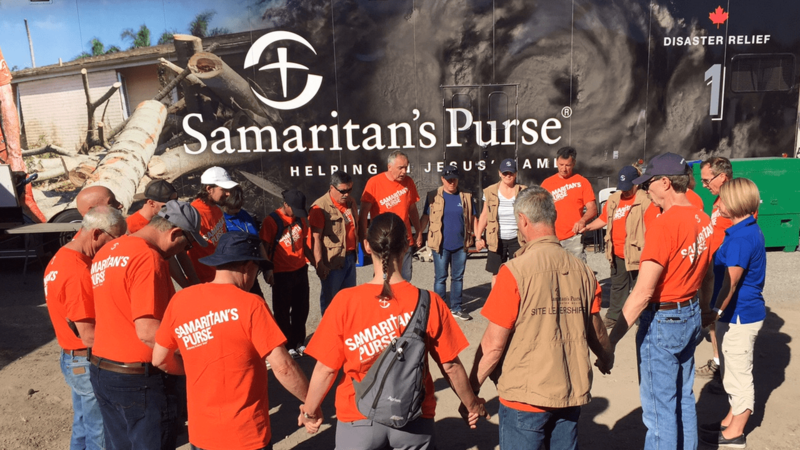 A day with Samaritan’s Purse is enveloped in prayer: just before we head out, the minimal staff, team leaders, volunteers and Billy Graham volunteers circle to pray for those we serve, each other, and a successful day of ministering through action. Some days, the team I was serving on prayed before entering a home. We always prayed at the end of the day before dispersing. We prayed with the home owners and gave them a Samaritan’s Purse Bible, personalised with messages from all the volunteers who worked in their home. The assurance that God had provided all the resources we needed for the day and that we would accomplish all the work He intended was calming and settling. Even as part of a team of 6 – 10 people, the work often seemed overwhelming at first. But I learned to trust and enjoy the work. Post-flood work in homes is called “mud outs”. The goal of a mud out is to prepare the house for rebuilding so that expensive contractor time is not spent doing work that non-skilled workers could do. The final step is a thorough spraying of all hard surfaces which had been wet or grown mold with an antimicrobial solution. First all the contents are removed then all absorptive materials are exposed and removed. This involves ripping off drywall, wood lath walls, and trim to expose fiberglass, stonewool, sawdust or wood shaving insulation. In many cases, removing flooring of various sorts was also called for. In the last house I worked in, two layers of hardwood flooring had to be removed. Boy, did that require some BIG pry bars, muscle and team work! I used a small ‘cat claw’ lever and hammer to pry an edge of one of the many squares cut into these two layers. This allowed another person to get a larger crow bar under the edge and pry up enough flooring for a second person to get their huge pry bar under as well. Together they would rip up the floor, piece by piece. It was hard work but so satisfying to finish the home, room by room. In the first few weeks, we found homes to be quite wet as flood waters, silt and mildew remained. Personal protective equipment was a must: N95 masks to eliminate the danger of breathing in mold, gloves to protect hands, earplugs, safety glasses, and Tyvek suits to keep dirty water off clothing. It was hot work, especially as Tyvek suits don’t ‘breath’. N95 masks were a challenge to wear all day but we got used to it. The elastic straps of the mask digging into my face all day left marks that lasted all night – a grim reminder of my aged skin! Mosquitoes abounded in the wet spring conditions. Fortunately, our well-stocked U-Haul trucks had lots of bug spray to make working in homes open to the elements bearable. We also had lots of hand sanitizer to use every time we took our gloves off. In most houses, power was turned off but not always! The team leader would check this important detail when we first entered a house. Water and bathroom facilities were also an issue. Once, a co-worker was disconnecting a dishwasher in preparation for removing water-logged lower kitchen cabinets. I had taken on the job of removing all the screws within the cupboards so was in the direct line of fire when the water hose disconnected and several of us got soaked! It was a moment of shock followed by laughter with new friends. Caring for the homeowners and volunteers is a high priority for Samaritan’s Purse. At each morning send off, we were reminded to treat the homes and contents with gentle respect, keeping in mind that what might look like garbage to us was, in fact, families’ possessions and history. Piles of furniture, sealed (with duct tape) refrigerators and freezers, appliances, ripped out wood, gyprock, flooring, and insulation, and all sorts of personal possessions were piled unceremoniously all along the streets of the affected areas. It was heartbreaking. Each day we assembled lunches and snacks for the day. We placed them in large baggies labelled with our name and then put them in a cooler with ice. Another cooler was stocked with bottled water and electrolyte drinks. We were required to take regular breaks and rehydrate. Always we were empowered to pace ourselves, working to our level of ability and stamina, and to take as many breaks as we felt we needed. We were tasked with caring for our co-workers emotionally, spiritually and physically. Daily safety talks reminded us to watch out for others as we hefted sledge hammers, ladders, long pieces of wood and other hazards. Another important message was the permission to stop working to minister to grieving homeowners as the need arose. We were encouraged to pray with them or just listen to their particular stories of loss or recollection, as their damaged homes evoked memories and feelings. It was a precious responsibility. As time went on, the homes we entered to fulfil work orders had dried out a lot. Much work had been done by homeowners waiting for their turn to be helped by Samaritan’s Purse. Emotions were less raw and we worked alongside of homeowners planning to improve their gutted houses. Optimism was a new emotion we encountered. On the last day, our task was to empty two of the three U-Haul trucks of all the equipment, wash all the tools and equipment and stow it in the 50 foot Samaritan’s Purse mobile work centre. We ate lunch and then went to the last house to rip out the heavy-duty floor. Another exhausting day! I made many new friends through this work, some who live in Grand Forks, Republic, Castlegar, Trail, Calgary, Edmonton, Mississippi and Florida! What an amazing group of dedicated, hard-working people came together to help our community. I will always remember my time working with Samaritan’s Purse. I plan to follow their disaster relief work and may well travel to another community somewhere in the world to help the people there, the way my neighbours were helped here. I was truly blessed to have been part of this ministry.